As a small manufacturer, it is crucial to get all your people working as productively as possible. One way of doing this is to minimise any activities that do not add value – in other words cut out waste. However, having read much of the advice in this section, you’ve probably realised there is a lot of emphasis on improved organisation, planning and processes. Now, for some this may initially appear more bureaucratic. And surely paperwork doesn’t add value? Simple layout with eligible text, plenty of white space, and the key messages conveyed clearly. Logical layout of procedures and processes. Use number sequences and version control, all adhering to a clear system employees are familiar with and can learn quickly. Use images and diagrams to quickly convey messages. Pictures really do speak a thousand words. Engineers are deeply technical people by nature, often happiest when talking the jargon of their respective industry sectors. However, there is the risk of over-complicating things where it comes to specifications and other technical documentation. This can add to development lead-times. Instead the aim should be clarity and information that is fit for purpose. Additionally, keeping things simple has the advantage of reduced misunderstandings and resulting in fewer defects, better quality, as well as faster training. The product development process rapidly produces lots of data. Reports, spec sheets, research literature, CAD models, technical drawings, quotations, CNC code – the list goes on. Organising and storing this information in a logical fashion assists product development team members find and access it when they need to. Document and data version control is crucial here. Keeping data in one location also helps. If done well, the advantages include more efficient communication, better decision making and better quality through fewer mistakes. KPI between projects, together with lessons learned, can often drive product development process improvements. Common KPIs used by manufacturing businesses include the following. In turn each of these have sub-categories that can be measured. Click on the image below for more. Embrace modern technologies such as 3D CAD, together with all its derivative technologies like 3D Printing, Finite Element Analysis (FEA), Computational Fluid Dynamics (CFD), Computer Aided Manufacture (CAM) etc. They all contribute to a dramatically improved development and manufacturing capability. 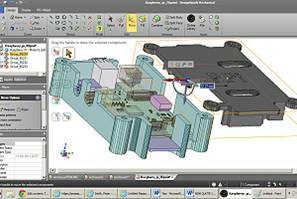 The CAD Engineering Essentials section provides a clear explanation of how they can significantly benefit your business. How CAD and all other derived Computer Aided Engineering technologies can dramatically improve your product development process.